We would like to introduce you to spoken word artist, E.G. Bailey. 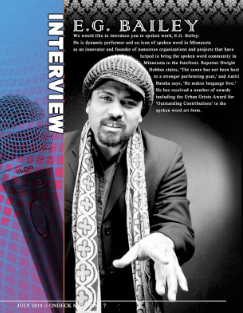 He is a dynamic performer and an icon of spoken word in Minnesota as an innovator and founder of numerous organizations and projects that have helped to bring the spoken word community in Minnesota to the forefront. 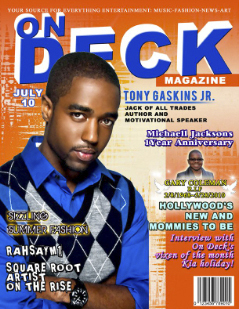 Reporter Dwight Hobbes states, ‘The scene has not been host to a stronger performing poet,’ and Amiri Baraka says, ‘He makes language live.’ He has received a number of awards including the Urban Griots Award for ‘Outstanding Contributions’ to the spoken word art form. ODM: You speak heavily on the “American African” and the struggle of identifying with African roots while growing up as an American. Why do you think it is a challenge for members of the African Diaspora and Africans who are raised in America to identify with they’re African roots? E.G. Bailey: Part of the reason that I made the album was to show that there are two communities and two realities for Afrikans in America. The typical understanding has been that Black people, regardless of whether they were from Afrika, or Haiti, or the United States, were generalized as African American. There was a time when the number of Afrikans were not significant enough to be thought of as a ‘separate’ community. The general belief was that they were just here temporarily, for school, for asylum or just visiting, and they would be returning to their country soon. However, events in the 80s and 90s have caused large migrations of Afrikans into the States. These young Afrikans, and the children of Afrikans, that came to the U.S. during that time, are coming of age and coming into their own. They are part of a much larger community now. So it is not so much that it is a challenge identifying with their roots, but it has been a challenge to be accepted. This generation of Afrikans, we love our roots; we celebrate it as much as possible. We know we are as brilliant, as beautiful and as strong as anybody else. What’s troubling is that those around us don’t always see that beauty. What’s troubling is the persistent negative images in the media. It still seems that no matter far we have come as Afrikans, the litany of suffering still burdens Afrika. Because of this, what is most pervasive in the minds of Americans, towards Afrika and Afrikans, is civil wars and famine and poverty and aids. It’s not to deny these exist on the continent but if those are the only images you see, that is all you know. I try to tell people how cosmopolitan, how advance, Afrika is. The first time I drove into Abidjan, I was struck by how much it reminded me of driving into Chicago. Johannesburg is one of the most beautiful cities I’ve ever seen, and the lushness of parts of Dar es Salaam would shock you. This all has to be balanced with the poverty and struggle of many living in these areas, but what population doesn’t. Look at the U.S. today. Look at Europe. The more positive images of Afrika that we can put out in the world the better. That is why it’s great to see the recent resurgence, and success, of Afrikan artists, such as K’Naan, Akon, Nneka and others; the revival of Fela; or to see the World Cup in South Africa. Hopefully some of this will contribute to burying the image of the ‘dark continent’ forever. ODM: Amongst many other things you are a poet and a musician, what inspired you to transform your poetry into a form of music and which musicians are you most inspired by? E.G. : As a child in Liberia, I hung out in the one record store in our village. They played all kinds of African artists but the most popular was Prince Nico Mbarga. His biggest hit was ‘Sweet Mother’, which still gives me chills to this day. When I came to the States, I fell in love with my father’s record collection. I listened to everything I could, from Mississippi John Hurt to the Persuasions to the Beatles to his compilations of early rock and roll songs, with Buddy Holly, Little Richard, Chuck Berry, Ritchie Valens, you name it. My parents also listened heavily to folk, country, and bluegrass–Emmylou Harris, Claudia Schmitt, Hoyt Axton, Dolly Parton, Charlie Daniels, John Prine, Steve Goodman. I would spend hours making mixtapes, on cassettes. We would travel during the summers, going to different festivals, even going to the Grand Ole Opry, and Dollyworld. My father and I would pool our money and buy albums together, like Dylan’s Biograph box set or Beatle’s White Album. I think he did it more to support my interest than his interest in the music. And of course, there was 80s radio. I was also heavy into new wave–New Order, Erasure, Echo and the Bunnymen, Public Image Limited, Sugarcubes (with Bjork)–also U2, Ministry, The Police, Talking Heads, early Nine Inch Nails. When CDs first came out, my first purchase was Boomtown Rats and New Edition. My family would also send me cassettes of African music from back home. So I was exposed to everything. I’ve had a few musical life changing experiences. One would be the first time I heard Prince. This was the 1999 album. I had to have everything he released, all the albums, the singles, the b-sides, everything. And then there was Purple Rain. But Prince didn’t inspire me to create poetry with music. I just thought that he was incredibly talented, and he helped me through my first major breakup. Most likely what first inspired me to set poetry to music was Jim Morrison. I happened upon a copy of Jim Morrison’s biography, No One Gets Out of Here Alive, and read it in one night. I then proceeded to get everything that Morrison, and the Doors, put out. This is when I first discovered Morrison’s poetic escapades. I had never heard of spoken word; I didn’t know such a thing existed. I didn’t even know that you could set poetry to music as a different concept than just lyrics to a song. When I heard ‘Celebration of the Lizard’ or ‘Horse Latitudes’ or ‘Texas Radio & the Big Beat’, I remember thinking I’d like to do that one day, combine my poems with music. It’s interesting, it wasn’t about writing songs, having a band, so on. It was very specifically combining my ‘poems’ with music. I wasn’t sure how this was going to happen, since I wasn’t brave enough to perform my poems at the time. The next significant event was college, more specifically, discovering jazz, The Last Poets, Nina Simone and hip hop at college. I had listened to jazz and hip hop in high school. Run DMC came out when I was still in high school and you couldn’t escape ‘Walk This Way’. There was early Kurtis Blow, LL and Fresh Prince, also MTV had just started. But it was mostly just casual listening. College was when I started to really immerse myself in jazz and hip hop, with Coltrane being my favorite, along with Eric B + Rakim, Tribe, Public Enemy and most of all De La. A teacher played a Nina track in class and I instantly feel in love. But what sealed the deal was a compilation tape a friend had made of the Last Poets. I listened to it constantly for the better part of a year. I still wasn’t performing at the time, but it heavily influenced and inspired me, and made the idea of performance poetry more real. ODM: You left your home country of Liberia at age 10. What would you say is the biggest difference between the two countries? E.G. : The most obvious answer is opportunity. I grew up in Saclepea, a village in the northern region of Liberia. We had unpaved roads, no running water, and those that could afford it used generators for electricity, otherwise it was kerosene lamps. But it’s like Nikki Giovanni says in her poem, ‘Nikki-rosa’, ‘though you’re poor it isn’t poverty that concerns you…only that everybody is together’ and ‘all the while I was quite happy’. To this day I still have a certain nostalgia for kerosene lamps, and I find rain falling on zinc roofs to be one of the most beautiful and soothing sounds in the world. But I was looking for my father, and I knew my father was American, and that I wanted to come to America to find him. At that time, we saw America as the Promise Land. If we could only reach it, all our problems would be solved; we would never want for money or food, whatever we desired. My first day in the States, my family attended a parade. In my naiveté, I thought the parade was for me; and when they started throwing money and candy from the floats, the prophecy of the Promise Land seemed to have come true. But eventually reality sets in and you learn that people throwing money at you from parade floats is as much of a fantasy for Americans as it is for Afrikans. I was fortunate because after coming to the U.S., I grew up in a middle class environment, and came from a family of teachers. I benefited from a strong educational background, and was able to attend one of the best colleges in the country. This was a sharp contrast to what my family was enduring back home because shortly after I arrived in the States, there was a coup in Liberia, followed by a civil war. I helped as I could, especially after graduating from college, sending as much money as I could to help support my family. I often had difficulty fully enjoying life in America. It’s jarring to be speaking with your mother on the phone, while hearing bombing in the background; or to learn that you have to bail her out of an Ivorian jail; or rescue your brother who has been abducted to be a child soldier. It’s almost impossible to feel that you’re doing enough. Even though I don’t have a lot, I’ve carried my share of guilt for what do I have and the opportunities I have had here. In light of all this though, what has struck me, when I have been able to return home, is the open-hearted love of life. There is also an abiding faith to persevere. They may not have much and the years have been difficult but there is still so much love and laughter, a willingness to soak in life, to celebrate and welcome you in. The pace of life helps you to appreciate this. In comparison, America looks like a colony of ants. ODM: You begin one of your poems with the words “blue black beautiful are we.” Today in the media sphere being dark and having African features aren’t typically connected with being beautiful. Why do you think the standards of beauty in the media are based on more European features? E.G. : If you control the media you have the power to control the message and to set the rules. The politics of power and propaganda are intertwined. To maintain a hierarchy, even if the truth of that hierarchy is a facade, it’s important that your standards become the norm or the celebrated. So that is what’s perpetuated, even though we know that beauty is a highly subjective, and perhaps an unclassifiable thing. We as a people, as individuals, have to move beyond this. We have let this be used against us too long. First you have to realize that your standard of beauty does not rest in anyone’s hands but your own. You must know that YOU are beautiful, and exude that beauty in every way possible. That’s not always easy when you are constantly bombarded with images that counter that. But that’s why we also have to control what medium we can. It’s now cliched to say that you have to ‘become the media’, but there’s a lot of power in that. That’s one of the things I like about social networking and how the internet has opened up avenues for everyone. With Myspace, Youtube, Facebook, Twitter, etc., you have the ability, if you want, to become your own media. You can become the medium for what you want to broadcast to the world. You may only touch and influence a few hundred to a few thousand people, but you are still affecting them, for better or worse. ODM: What do you want people to take from work? What message do you want them to receive? E.G. : First I would like them to enjoy the work. Too often people stay away from spoken word because they think it’s too serious, too boring, too depressing, or it has no music, or the music is outdated. This album is not like that. It’s not pop commercial mainstream music but it’s not dry or boring or outdated. It has great music that fuses all kinds of different styles and genres, and pays tribute to our amazing musical tradition, including the different styles of spoken word throughout history. I wanted to create something that hip hop heads, funksters, jazz cats, Afrikan musicologists, techno lovers and those that appreciate a cappella spoken word could all enjoy. And to have a greater appreciation for spoken word. In addition, I wanted them to walk away with a better understanding of where Afrikans living in America are today, their legacy and aspirations. Also that it is possible to live in America and still hold Afrika in your soul, your heart, your everyday thinking and living. ODM: You have managed to transform your poetry into several different forms, not only music but also film, theatre, and radio. Of all these genres which is your favorite to work with? E.G. : I don’t have one favorite form; I love certain aspects of the different forms. I love directing films, and the rehearsal process of theatre, as an actor and a director. I love screenwriting more than playwriting, but with both of these I prefer to do adaptations. I could spend all day in the recording studio, whether I’m recording or someone else is. Conceptualizing and creating music is a big high. I enjoy doing radio but mostly because I love sharing music with people. I also enjoy creating radio pieces or documentaries but don’t do it often. I’ve worked through my nerves enough to get to the place of liking live performance, especially if it’s with a band. But I’ve always said that film is my final destination. One of my favorite filmmakers is Orson Welles. He took his experiences from all these different mediums and brought them to film. That is what I like to be able to do, draw on all these experiences and bring it to film. ODM: You have received recognition for your phenomenal work in the form of awards and recognition from other artist in your field. How did you react when the famous poet Nikki Giovanni praised your work? E.G. : I couldn’t believe it actually. It was a feeling of accomplishment. Not accomplishment in the sense of achieving anything. But there are writers that have inspired you and sustained you since you were young. You learned not only how to write from them, but how to live, how to love your history and yourself, how to more clearly see the world. There a few writers like this for me, and Nikki was one of them. Another was Amiri Baraka, who I call the Godfather of Spoken Word. Studying Nikki, Sonia, Amiri, Larry Neal, Haki and others in college opened my eyes to new ways of writing. Actually it taught me not to be afraid to write in my own way, whatever that is. Because I couldn’t speak English when I first came to the States, I carried a lot of insecurities as a writer, and always felt like I had a late start compared to my peers. Learning how they took ownership of their own voice and their own language, and freed themselves from what was considered proper English and proper poetry, gave me faith and freedom to continue my own path with my writing. The track on the album, ‘Blues People’ is actually dedicated to ‘amiri, nikki, sonia and dem’, and is a tribute to their efforts to reclaim Black poetry and celebrate the Black Vernacular. I’ve had a copy of ‘Black Feeling, Black Talk/Black Judgment‘, and also of ‘Gemini‘, for as long as I can remember. ‘Truth Is On Its Way‘ is one of the best spoken word albums ever recorded. We used to perform her poems ‘Ego Tripping’ and ‘Genie in a Jar’ as part of the spoken word band, Arkology. So for her to find value in my work, and to take the time to send a postcard, it was truly an honor. ODM: Some may argue that poetry combined with music is simply the creation of rap music. Do you agree or disagree with this statement? E.G. : This is a misunderstanding we have to correct all the time. I tell my students that even though most people assume that spoken word came about because of hip hop, and that spoken word is just hip hop without a beat, the truth is that spoken word helped to give birth to hip hop. I try to teach them that the Last Poets had already laid the foundation and released the blueprint well before the release of what’s considered the first hip hop track in 1979. One listen to ‘E Pluribus Unum’, which was released in 1972, and you can hear that the form is already in place. If it was recorded in 1972, it was created sometime before then. This would be before what is considered the birth of hip hop–summer of ’73 at the Kool Herc party at 1520 Sedgwick Avenue. I try to explain it this way. The Last Poets had the highest selling poetry based album of all time with their first album, over one million copies. A spoken word album, selling over one million copies; so you can understand its significance and impact. This means that it’s in households all over the country. Gil Scott Heron also releases ‘Small Talk at 125th and Lenox‘ the same year. So, ‘The Revolution Will Not Be Televised’ is also playing in households across the country. That means that the young people, that would later come into their own and help to create hip hop, are hearing all this. Every generation takes what they receive from the previous generation and transform it into their own. They would take these influences, and add them to the numerous other influences and elements, to eventually create what became known as hip hop. That’s why the Last Poets can legitimately be called the ‘the godfathers of rap’. For me, hip hop is the lyrical evolution of spoken word. However, spoken word had been in existence long before, and was often married with music. It was married with jazz in the 40s and 50s; it was married with funk in the 70s; Nikki married it with gospel for ‘Truth Is On Its Way‘; I’ve combined it with folk music. Spoken word with music goes beyond simply being the creation of a bastardized form of rap music. Which is part of why I love it. The freedom of it allows it to be almost anything; it’s not trapped in a single form or genre. ODM: How did you start writing poetry? Did you always know that this was the path you wanted your life to take? E.G. : I first started writing poetry out of isolation. I was a fly in the buttermilk where I grew up. I didn’t speak the language. When I started school, I was years behind my peers. Making friends was a challenge. There were many days I felt like an outcast. One day I wrote a short poem on friendship, and it released all the pain and frustration that I was feeling. From then on, poetry became a refuge. I had no plans for it become my vocation. It was just a place I felt free and safe, without judgment. My plans were actually to study photography, as a means to becoming a filmmaker. Most of my time in college was spent as a photographer, and working as a photo editor for the student newspaper. Once I graduated, I decided I wanted to be an artist rather than work in a corporate job, so I ran a house painting business for the summer, took the money I earned and moved to Fargo with a girlfriend. I put a desk in the laundry room of the apartment and started writing, and acting in the local theatre. I had no specific goals of becoming a poet or a writer, but I knew I wanted to be an artist, however that came to be. 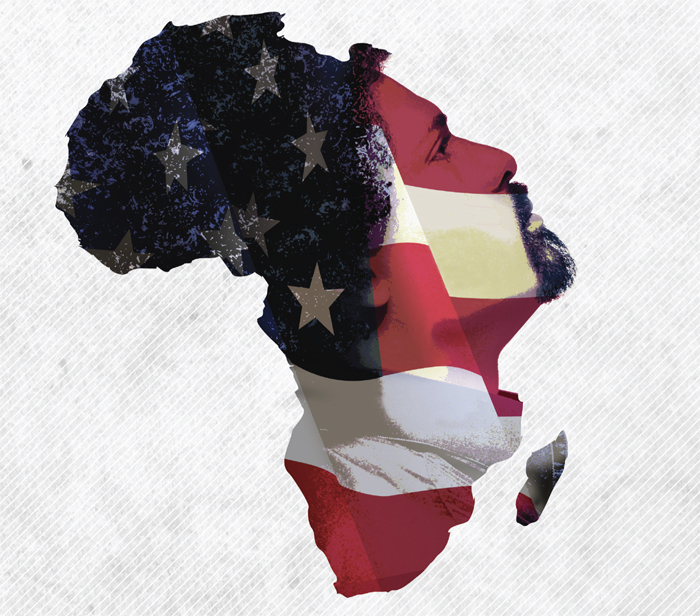 ODM: Which track on your album “American Afrikan” is your favorite and why? E.G. : This is difficult because I like all of them for different reasons. But if I had to choose I would highlight two of them. One is ‘American Afrikan’ because it was one of the genesis of the album, it inspired the concept of creating an Afrobeat style spoken word track. There was a time I worked in Madison while living in Minneapolis, which is a 4-5 hour drive. I would have to travel back and forth several times a month. On these trips I would listen to Fela continuously, and practice my spoken word over his long instrumental breaks. It surprised me that no one had made any Afrobeat spoken word tracks because it seemed to be such a great fit. As I drove I would think of who I would love to collaborate with in the group, what kind of pieces we’d create, so on. The Afrika 7 version of ‘American Afrikan’ is that group come to life. I’m very happy that the track, and the remix, represents Afrikan artists in the Twin Cities. The second would be the ‘Oracles of Equiano’ remix by Starskie. I knew I wanted him to do a remix but what he sent, and how he changed it from what I sent him was so unexpected and brilliant at the same time. You don’t hear very many spoken word house tracks, so I was glad to be able to include it on the album. I like to push the boundaries of what people expect spoken word to be, that way we can widen the field of what can be created in the art form. ODM: Tell me about your poem titled “America” what message were you trying to send with it? E.G. : I was asked by a friend to write a few pieces for a jazz album he was creating called ‘Polidix’, and ‘America’ came out of that collaboration. There is a tradition of ‘America’ poems, from Walt Whitman to Allen Ginsberg to Claude McKay. I wanted to challenge myself and see if I could write something worthy of that tradition. I’ve always love Ginsberg’s ‘America’ poem so it was somewhat of a tribute to that poem. At the time, Ginsberg was addressing the Cold War, anarchist movements, labor struggles, nuclear war, among other issues. I wanted to look at where we were in post-9/11 America, which seemed to be dealing with a lot of the same issues but under different guises. Since 9/11 everything seems to have gone into a deeper tailspin than it normally is, with the war on terror, the Iraq war, Guantanamo, Katrina, the economic crisis, the health care debate, you name it. I wanted to address all of this but also the history of the country, what it was supposed to stand for and whether it was living up to these ideals it continues to espouse. The world had changed so much since 9/11 that even the 80s felt quaint and nostalgic. This was written a few years after the deflating loss of the 2004 elections, so it was written with some hope looking towards the 2008 elections. That is why leading up to the elections, I made postcards of the poem with a placard on the back encouraging people to vote. We needed and still need a change. The ‘resurrection’ has not happened yet, and we have to continue to work and fight for that change. History is vital to all people, but perhaps most vital to our people because so often that history has been lost, stolen, erased or buried. So we are in constant search to reclaim our story and place it in the proper context. My goal with the album was to trace the arch, the journey, of Afrikans in America, so it had to have a historical impetus. I wanted to cover various landmarks and signposts in our history, even if only symbolically. So that the listener could see how far we have come, how we have persevered and how much we have created in the process. This has been, in many ways, the case with my own journey. I knew about Afrika experientially as a child, but I didn’t know the history, same with America. I came to a new and strange land; I had to study, to learn about where I found myself, how it functioned, how my people survived, so that I could learn how to survive because I needed to survive. I also made the album with my son in mind. I wanted him to be able to listen to it one day and understand where he comes from, both Afrika and America, with all its beauty and flaws, and to be stronger for it. However, a quote from John Henrik Clarke probably says it best, ‘History is a clock people use to tell their historical culture and political time of the day. It’s a compass that people use to find themselves on the map of human geography. The history tells them where they have been, where they are and what they are. But most importantly history tells a people where they still must go and what they still must be.’ This articulates the essence of why I needed to create the album, both for myself and for my community. ODM: How have you used your success to give back to your home country? I think the best way that I can give back to my home at this time is to tell our story. Even though people may know about Liberia, it is a very narrow understanding. There is very little known about the native Liberians. They may know that Liberia was settled by freed slaves from America, or about the civil wars or Charles Taylor. Most people don’t understand the complexity of these facts; what it meant for the native Liberians to have the freed slaves return home, and how it shifted the course of their history. What were the aspirations of the freed slaves, what did they hope to accomplish? How did all this play into the conflicts that would later arise? That’s what I like about the ‘Liberia’ track because it tells the history from different perspectives, from the native Liberian perspective, the Americo-Liberian perspective and a personal perspective. In addition, I want to encourage Liberian youth, whether in the Twin Cities or other parts of the U.S., even back home, to become artists. I want them to articulate, and expand our story and our history. Liberia has been overlooked artistically for too long, in music, literature, film, theatre, etc. I would love nothing more than an artistic renaissance of Liberian artists. That’s why I get excited when I learn about artists like Liberian filmmaker Gerald Barclay (Gee-Bee), or playwright Cori Thomas, or writer Helene Cooper, that are not only at the forefront of Liberian art, but also breaking ground in the American artistic arena. That is also why I am creating a Liberian youth showcase, called L.Y.F.E. (Liberian Youth Finding Empowerment) Showcase, so they have opportunities to express their talents and their stories, and foster a new generation of Liberian artists. Note: Each year, the Echo Chamber presents their annual ‘Word Beat I Powa’ dub poetry special. The special brings together a great collection of dub poetry with ventures into beat poetry and spoken word. It’s consistently one of my favorite shows of the year, and turns me on to new dub poetry and spoken word. I’ve had the privilege of being a guest on the show in the past, and am blessed to be featured on the show. Below is information on this year’s special. On April 22, 2009 the Echo Chamber presented the annual “Word Beat I Powa” dub poetry, beat poetry, and spoken word special. Of course, it was dub poetry that set the foundation and included the dub poets Oku Onoura, Mutabaruka, Royal African Soldiers, Jean Binta Breeze, Benjamin Zephaniah, Oliver Smith, and of course, the incomparable Linton Kwesi Johnson. Other slices of dub poetry included the new Dub Gabriel track “Spirit Made Flesh” (featuring Karen Gibson Roc); the extremely chilled “No Ordinary Life” from JEN & Chin Chillaz; and the very cool “Dilly Dally” from the Brooklyn Funk Essentials (featuring Everton Sylvester). But there was more than dub poetry. As always, the “Word Beat I Powa” special included some beat poetry (with readings from Jack Kerouac, Gregory Corso, & Allen Ginsberg) and some great Jamaican DJs (including U-Roy, Prince Buster, I-Roy, and Dennis Alcapone). One of the highlighted rhymesayers was KFAI’s own e.g. bailey with his fantastic “America” and 2 other poems (including “Griots”). Finally, we included poems and other spoken word gems from Jah Wobble (feat. Ronnie Drew); the new Heavyweight Dub Champions album (feat. Dr. Israel & Elf Transporter); Cool Hipnoise (feat. Last Poets); The Fire This Time (feat. Assata Shakur); Dr. Echo (feat. Solange St.Croix); Symarip (aka Roy Ellis); Dr. Ring-Ding; and the incomparable Ken Nordine. And, to complete the word-beat chaos, DJ Baby Swiss included the “Green Slime” trailer and soundbytes from the original “Space Ghost” cartoon on top of some heavy taiko beats from Kodo. Show us your best poet face!